Generally, migration law (namely, s12 of the Migration Act) mirrors the Marriage Act 1961 (the Marriage Act) in determining the ‘validity’ (recognition) or not of marriages, whether solemnized (that is, the ceremony performed) in or outside Australia. If, for whatever reason, a marriage is not recognised under migration law (that is, s5F(2) requirements cannot be met), the parties’ relationship is to be assessed against the s5CB definition of de facto partner (and de facto relationship), for which see PAM3: Act – Act-defined terms – s5CB – De facto partner. Reference is made in this and related departmental instructions to ‘real consent’. (iii) that party is mentally incapable of understanding the nature and effect of the marriage ceremony’. By operation of s88D(2)(d) of the Marriage Act, foreign marriages also are not recognised under the Marriage Act if ‘real consent’ was absent. “Real consent” may be a factor in certain Prospective Marriage (300) visa applications – see section 9 Arrang​ed marriages. However, in assessing whether or not a marriage that has already been solemnized is recognised under migration law, it is not appropriate for departmental case officers to decide that a marriage is not recognised because ‘real consent’ was absent. this is (or was) critical to a decision as to whether or not a spouse relationship exists (or existed). Most marriages solemnized in Australia are solemnized under the Marriage Act, unless performed under the laws of a foreign government by a consular official of that government. Marriages under the Marriage Act can be solemnized outside Australia by (authorised) Australian consular officials and Australian Defence Force chaplains. In this and related departmental instructions, “foreign marriage” means a marriage solemnized other than under the (Australian) Marriage Act. It can, in limited circumstances, include certain marriages solemnized in Australia, that is, where solemnized under the laws of a foreign government by a consular official of that government. However, for the purposes of this instruction, it is assumed that the (foreign) marriage was solemnized outside Australia. Whether or not a foreign marriage is recognised under migration law depends first on whether it is recognised (as valid) in the country in which it was solemnized. A marriage not recognised in the country in which it was solemnized will not be recognised under the Marriage Act nor, it follows, migration law. Officers outside Australia should familiarise themselves with the local laws on marriage and recognition of marriages, keeping in mind that different rules may apply where a party to a marriage is not domiciled in the country where the marriage was solemnized. in Australia should seek the advice of the consular representatives of the country where the marriage was solemnized. The fact that a marriage may have been arranged by relatives, friends or marriage brokers does not affect recognition of the marriage (under the Marriage Act or migration law) unless one of the parties has not given “real consent” to the marriage – see section 6 Marri​ages and “real consent”. Although an arranged marriage might meet s5F(2)(a) requirements, officers are expected to take particular care in assessing whether or not the relationship meets s5F(2)(b) and (c) requirements (that is, a genuine, on-going, mutually-exclusive marital relationship) to be a spouse relationship. This requirement must be met by all TO-300 primary applicants, including those whose marriage was arranged before they turned 18. Often an arranged marriage arises from commitments given before one or both of the parties to the marriage reached marriageable age. In such cases, the marriage commitments (contracts) are often given when the parties are infants and are characterised by the initial absence of informed and voluntary consent to the marriage of the prospective partners. the party concerned prefers that the marriage not proceed. In either case, because Schedule 2 criterion 300.216 requires officers to be satisfied that ‘the parties genuinely intend to live together as spouses’, officers are in effect obliged to be satisfied that “real consent” – see section 6 Marri​ages and “real consent” – has been given by both parties to the impending marriage. Officers should, however, exercise care and sensitivity where there are indications that real consent has not been given. There may be serious implications for the safety and wellbeing of the prospective spouse should that person’s unwillingness to marry become known to persons other than the s65 delegate. Australian law requires that consent be given by both parties in person. In some countries, however, marriage by proxy is permitted. both parties gave real consent to the marriage – see section 6 Marriages and “real consent”. Migration law does not recognise marriages that (under s88E) are recognised in Australia solely because they are recognised as valid under common law rules of private international law. ​​’For the purpose of deciding whether a marriage is to be recognised as valid for the purposes of this Act, Part VA of the Marriage Act 1961 applies as if section 88E of that Act were omitted’. certain underage marriages – see section 14 Underage m​arriages. Foreign marriages where the consent of either party was not real consent are not recognised under the Marriage Act – see section 6​ Marriages and “real consent”. Polygamous marriages can arise in those countries where persons may have two (or more) married relationships concurrently. neither relationship is capable of being a married relationship. In order for s5F requirements to be met, there can be only one ongoing partner relationship; any concurrent polygamous relationship/s must have already ended (by death or permanent separation). Assuming that there is only one ongoing partner relationship, the question may arise as to whether or not that relationship is, under migration law, a married relationship as described in s5F of the Act or a de facto relationship as described in s5CB(2) of the Act. Only the first marriage in polygamous marital situations is capable of being recognised as a valid marriage under migration law (given the exclusion under migration law of s88E of the Marriage Act). It follows that only this “first spouse” relationship (if the current ongoing relationship) is capable of satisfying s5F(2)(a) requirements. Section 5F(2)(b) requirements must also be met in order for this “first marriage” to be a spouse relationship. In particular, the parties to this first marriage must have a mutual commitment to a shared life to the exclusion of all others, including any concurrent ‘spouses’. This in effect requires any concurrent “spouse relationships” to have ended. parties to the ‘surviving’ marriage are capable of satisfying s5CB ‘de facto relationship‘ requirements, again provided theirs is the only ongoing marital relationship (any other marital relationships must have ended, by death or permanent separation). 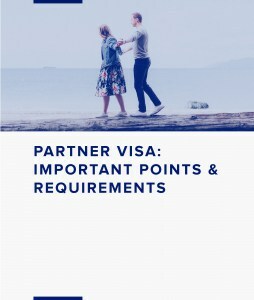 Nothing, of course, precludes any concurrent spouse from applying for a visa in their own right, that is, on the basis of satisfying primary criteria in circumstances where eligibility does not derive from a spouse relationship. A marriage between parties who are within a prohibited degree of relationship is not recognised under the Marriage Act or, it follows, migration law. Marriages between cousins or between nephews and aunts or between nieces and uncles are not prohibited under the Marriage Act and, it follows, meet s5F(2)(a)requirements. Note that this provision of the Marriage Act is mirrored in s5CB(2)(d) to apply equally to de facto relationships. The marriageable age in Australia is 18 years of age. The Marriage Act does, however, recognise certain foreign marriages where one or both of the parties are under 18 years old. neither party to the marriage, for the purposes of the Marriage Act, was domiciled in Australia at the time of the marriage (for guidelines on domicile’ see section 15 Dom​icile). either party was under Australian marriageable age at that time. If both parties were domiciled outside Australia at the time of marriage and one or both were under 16 at the time of marriage, the marriage is not recognised while at least one party is under 16, but becomes recognised once the youngest party turns 16. A person between the age of 16 and 18 years who is domiciled in Australia is considered of marriageable age only if an order has been made by an Australian judge or magistrate under s12 of the Marriage Act authorising a marriage between that person and another specified person who is over 18 years. Such an order remains in force for three months.